Police deaths on roadways decreased this year, but it’s no time to be complacent! Officer safety is a topic very close to our heart here at Laser Technology Inc. (LTI), and that’s why we regularly team up with the National Law Enforcement Officers Memorial Fund (NLEOMF) to present potential life-saving tips to help keep police officers across the country as safe as possible. This year, LTI and the NLEOMF are again joining to present traffic safety tips for on-duty police officers at the 2016 International Association of the Chiefs of Police (IACP) Annual Conference and Exposition in San Diego. LTI and the NLEOMF will present “Effective Tactics for Officer Safety” at 1 p.m. (PDT) Monday, Oct. 17, in the IACP Solutions Presentations Theatre. During this learning session, renowned traffic safety professionals will discuss the best methods, technology and equipment for maintaining safety for on-duty police officers. The presentation includes tips on how to enhance officer visibility, how to minimize risks while making traffic stops and how to reduce fatal accidents that involve officers. The NLEOMF also will provide some statistics from its 2016 Mid-Year Law Enforcement Officer Fatalities Report and offer additional context for how departments can increase officers’ well-being in the line of duty. 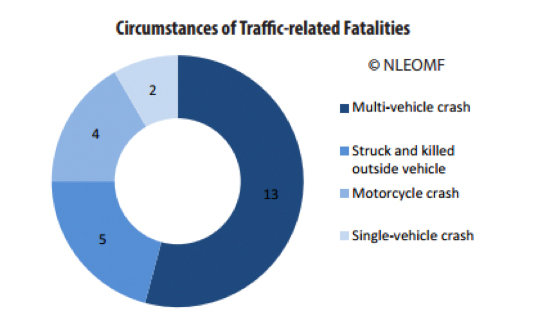 While the report details a variety of information regarding police fatalities, it specifically sheds light onto officer deaths due to traffic-related incidents. For the first time in three years, according to the report, traffic-related incidents were not the leading cause of law enforcement deaths. 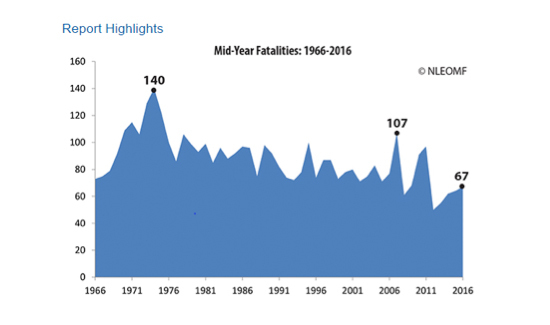 Down 17 percent decrease from 2015, traffic-related incidents are now the second-leading cause of officer fatalities so far in 2016 behind gun-related deaths, which nearly doubled in what’s been an increasingly turbulent year for law enforcement personnel. In fact, traffic deaths have led firearms-related deaths in 15 of the past 20 years. And that’s why LTI and great organizations such as NLEOMF tirelessly work to promote and increase officer safety on the job, especially when it comes to those men and women patrolling our roadways. • As of July 20, 2016, 67 law enforcement officers have died in the line of duty, an increase of 8 percent this year compared with the same period last year, when 62 officers were killed on the job. • The NLEOMF report recorded a 78 percent increase in firearms-related officer fatalities, many of which were ambush-style killings. • Twenty-four states did not record an officer fatality in the first half of 2016. These are just a few of the statistics from the NLEOMF findings; those interested in additional details can access the full report. To hear further context on these figures and how law enforcement agencies across the U.S. are employing and adjusting safety protocols, attend the “Effective Tactics for Officer Safety” presentation hosted by LTI and the NLEOMF at the 2016 IACP Conference. Find all the necessary registration details here. For those not able to attend this year’s IACP event, LTI and the NLEOMF have set up a follow-up webinar that recaps the “Effective Tactics for Officer Safety” IACP presentation. You can sign up for the webinar, which will be held at 9:30 a.m. (MST) Tuesday, Nov. 1, by REGISTERING HERE. LTI is excited to share all of the great information and resources available for protecting officers in the line of duty, and we hope to see you in San Diego!